THE REVIEW: You’ve all seen the trailers and the stories about how Tom Cruise, who plays Ethan Hunt, does all his own stunts and actually hung from the outside of an A400 aircraft while it was flying. It certainly sounds extraordinary and provides a lot of spectacle to draw viewers into the film. Choosing to have this widely-publicized and high-octane stunt take place in the first five minutes of the film is a bold choice, like revealing your hand too early in a card game. Thankfully, Mission: Impossible – Rogue Nation has a lot more tricks up its sleeve and the opening scene on the A400 actually turns out to be somewhat of an afterthought by the time the end credits roll. In Rogue Nation, the IMF is gone thanks to CIA director Alan Hunley (Alec Baldwin) which means Hunt is pretty much on his own trying to track down the Syndicate — an anti-IMF of sorts as Benji (Simon Pegg) puts it. Of course, a movie just following Ethan Hunt around wouldn’t be much fun at all, so he quickly pulls Benji aboard along with Brandt (Jeremy Renner) and Luther (Ving Rhames) later on. He also has on on-again, off-again working relationship with Ilsa Faust (Rebecca Ferguson) who helps Hunt, but is also working for the Syndicate and British Intelligence, so loyalties are a very fluid with her. One of the best things about this latest installment in the Mission: Impossible franchise is its ability to remain fresh. Like the Fast and Furious series where each new movie seems to be better than the last, Mission: Impossible also follows this anti-pattern where the sequels are better than the movies that came before it. Considering how great Brad Bird’s Ghost Protocol was and the high bar he set for the franchise, it’s a welcome site to a trend of “originality” continue. While a lot of the appeal of M:I has always been the stunt work — with Ghost Protocol serving as the epitome of that being almost wall-to-wall action and death-defying moments — Rogue Nation actually takes a step back, I’d say. Yes, there’s still a lot of action and car chases in Rogue Nation, but writer/director Christopher McQuarrie also includes some quieter moments of reflection and development. All the Mission: Impossible movies share the same universe, but can really be treated as standalone films. A lot of the story arcs don’t overlap and the only characters that have been in all five are Ethan Hunt and Luther. Rogue Nation has the most carry-over of any film thus far in terms of characters, but the more powerful inclusion is a sense of place. The actions have consequences in Rogue Nation whether it be the shutdown of the IMF in the beginning (due to lack of oversight and “luck”) or the risk of agents at the end (I won’t say who, because spoilers). We’re not just taken for a fun and thrilling ride this time around, we’re taken on a journey that forces us to care about these characters more than we really have up until this point. (The ending of Mission: Impossible III might serve as a good counter-example to this). Mission: Impossible – Rogue Nation is by no means perfect though. For all the danger and evil ascribed to the Syndicate and its leader Solomon Lane (Sean Harris), there isn’t any real destruction or mayhem we see take place. There’s no plot to end the world as we know it or cause any wanton mayhem chaos, merely just veiled threats that don’t come close to fruition. Early on, we see a bunch of newspaper clippings that Ethan Hunt gathers showing the scope of the Syndicate and the evil they’ve inflicted, but in terms of present danger, there’s isn’t much there. THE TAKEAWAY: Despite the lack of a great villain though, the newest Mission: Impossible still manages to impress and improve upon the films that have come before it. Like the previous films, you don’t need to know what happens before to enjoy this one individually, though if you haven’t you’ll probably want to in order to see more of Simon Pegg’s Benji. 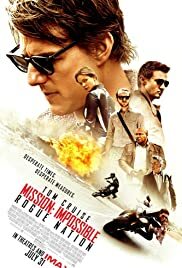 Rogue Nation delivers massive and impressive stunt work (done as always by Tom Cruise himself), many team-building moments like Ethan/Benji’s tag-team at the Vienna Opera, and a bit of reflection as we question whether the work Hunt and the IMF does is actually for the greater good. A great movie to see, and an especially great film to see while in theaters.